A couple of months ago, I decided to finally use the GC I got from attending Krave Minerale's first anniversary event back in January and got myself some things from their new and revamped makeup line. I was pleasantly surprised that it arrived only a few days after I placed my order! So what did I get? Krave's Visibly Rosy powder and Misty Pritz setting spray! I've been looking for a decent, budget-friendly setting spray and loose, finishing powder for a while now so choosing these products was a no-brainer for me. Don't you love the new packaging? I think it looks a lot more sleek and sophisticated now. If you want to know more about what I think of them, click below! 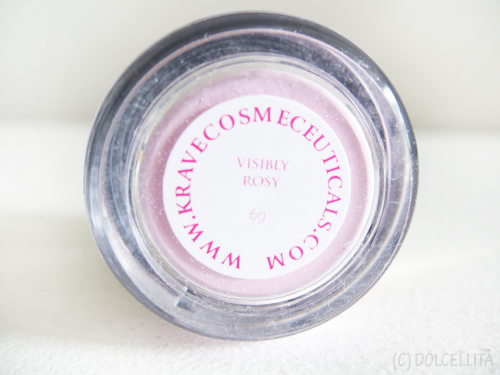 Now let's take a closer look at the Visibly Rosy powder. 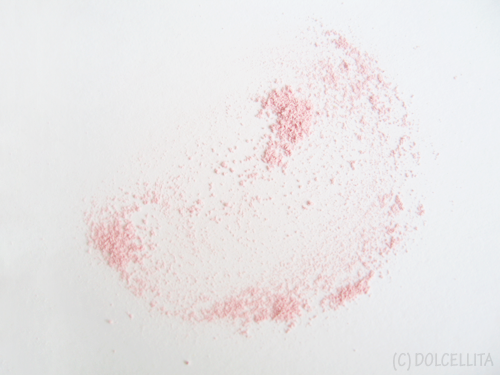 It's described as a "mineral veil with rose hips and kosher rice extracts" that has a "pinkish finish" and is "regenerating, healing & soothing". If you're familiar with Krave's products, you'll know they use cruelty-free, all-natural ingredients that not only helps your skin look better, but allows it to benefit from the ingredients as well. The box also labels the product as paraben-free, nano particle free, gluten-free, non-comedogenic, and certified as USDA organic and given the Natural Ingredient Pledge. Description: Get rid of pale & lifeless skin. 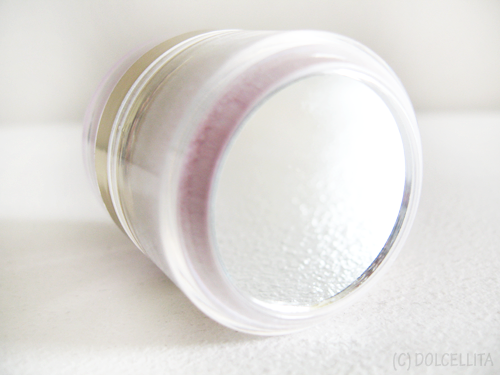 This mineral veil can help reduce the appearance of large pores & can brighten up dull skin tone. Achieve a natural pinkish glow with the infusions of Rose Hips & Kosher rice extracts that promote skin regeneration and provide wonderful results in soothing and healing sun damaged skin. It promotes the skin's condition helping it produce more collagen and elastin. The 6 grams worth of product is housed in sturdy, clear plastic allowing you to see just how much product you have left which is always a plus in my book. Of course, it also comes with an attached puff. At the top of the product is a mirror. It's small and frankly, only great for emergencies in case you're lacking a bigger one or just need to retouch particular areas of your face. The bottom label. As this is technically supposed to be a (mostly) translucent powder, at least compared to its counterpart Krave's Oil Eliminator which is completely translucent, it only comes in one "shade" which is Visibly Rosy. The puff was already tinted a pale pink when I removed the cap, a tell-tale sign that some of the product had 'leaked' out a bit already onto the puff. I suggest that Krave modifies this particular packaging by perhaps adding some kind of plastic or easy to remove sticker somewhere between the powder and the bottom of the puff to prevent this from happening. 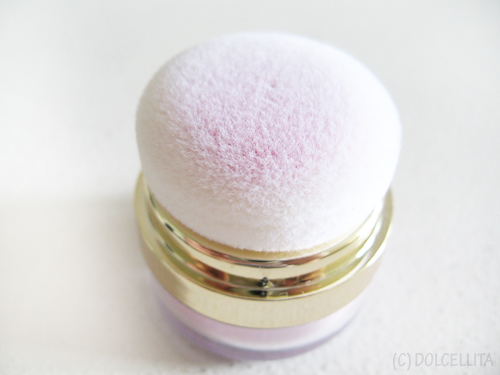 The puff itself is soft yet still semi-dense, almost like a cotton sponge. I'm not a fan of applying makeup with any applicators that come re-attached. I always find they don't apply the product as evenly or as nicely, so to use this I open it to reveal the powder and reach for a separate brush, a powder brush of course, and I'm able to control the amount of product released much more easily too. The powder itself is almost silky and very fine, which I love. 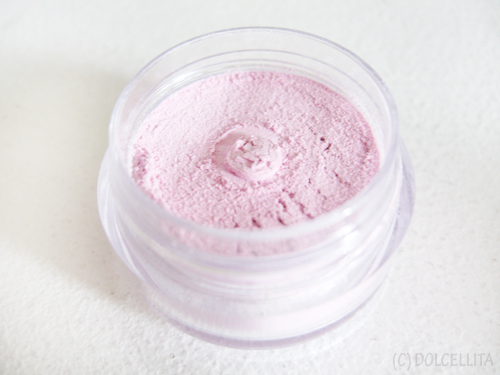 The more finely milled the powder is, the better it applies onto and blends with my skin and most skin in general, I think. Here I've started blending out the powder onto the paper. After. 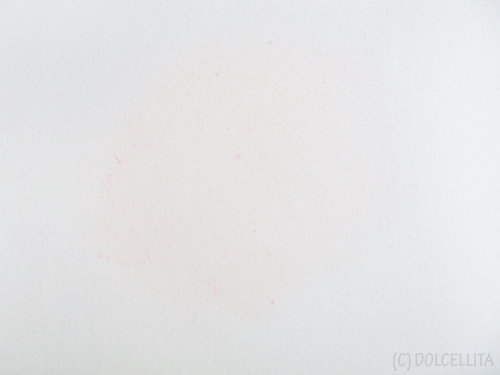 As you can see, there's still some faint color left on the paper. If this was truly just a translucent powder, there'd be nothing showing up at all. Basically if you find that your liquid foundation or BB cream makes your skin tone look dull or flat, especially those BB creams that give you a grayish cast, or if your skin tone is that way naturally, reach for this to add a bit of color that'll liven up your complexion and make it slightly healthier looking because of that touch of pink. 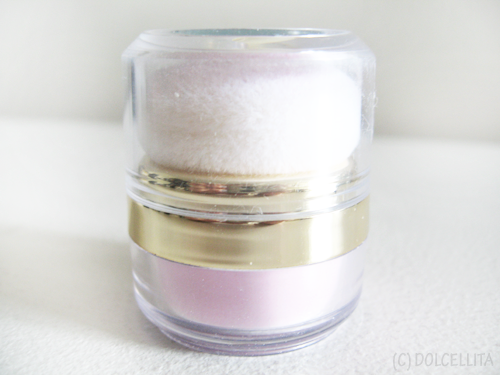 At the very least I find this product a good setting and touch up powder! Great for people with sensitive or acne-prone skin, especially since it's non-comedogenic. Some may find the price a bit too steep for only 6 grams worth of product. Moving onto Misty Pritz which is a "3 In 1 Make Up Staying Spray" that contains rooibos tea, green tea, and white tea extracts. Description: MIST SPRITZ make up staying spray gives you 3 in 1 benefits. Anti-aging, Anti-bacterial & Anti-oxidant from Rooibos tea, Green tea & white tea properties. It just not help your make up last longer, but it also controls excessive oil at the same time. Spray it anytime & anywhere to kill the bacteria formation obtained from outside pollution. It keeps you from often retouches. Just one to two spray and your make up will look & feel fresh again. Like the powder, it is also labeled as paraben-free, nano particle free, gluten-free, non-comedogenic, and certified as USDA organic and given the Natural Ingredient Pledge. The product is housed inside a thick, glass bottle and is dispensed via a spray nozzle. So far the glass seems durable and is actually a little heavy, but I still wouldn't risk toting this around with you in case it does break. Besides, it'll take up considerable space in your bag or makeup kit. As recommended, I only need a couple of sprays at most to able to mist my face with this just enough. So far it does manage to keep my makeup lasting a little bit longer, with an accompanied primer beforehand of course, and maybe adds a couple more hours or so at most in terms of my makeup's longevity. However, don't expect this to pull through if you get sweaty or naturally have very oily skin since its effects seem to disappear along with the sweat and oil. Speaking of oil, I didn't notice any of its 'oil control power' since I still developed some decent shine in my t-zone as I naturally tend to do by the middle of the day. Can alternatively be used as an instant hydrator if your skin is feeling a little dry. In a highly polluted country such as this, I think the anti-bacterial properties in this is a definite plus, especially if you commute or are outdoors a lot of the time. If you feel like 'retouching' with this to make sure your makeup stays on all day, you can easily transfer this to a mini atomizer and spritz away any time. Can be a cheaper alternative/dupe to high-end setting sprays such as MAC's "Fix+". The label covering the bottle doesn't really allow you to see how much product you have left. I find the effectivity of the product weakens or disappears with sweat and excess oil. Again, outer packaging is difficult to read because of the font. But it's much clearer on the inner label attached to the bottle. You can check out and order from Krave's official website. Don't forget to like them on Facebook, and follow them on Twitter and Instagram. Interesting products. Thanks for sharing dear. Looks like a really interesting porduct. Has a really cute color. The only bad not contro oil. Many thanks for share this product. I hope your follow me back in both. That powder looks great! I like the more subtle colors. Me too! It's always good to have at least one translucent powder and one with some color to it in case you need to adjust your liquid base. It's funny that we got the exact same items from the GC. hahaha I should have said hi to each other during the event. I'd love to! Followed you on twitter, dear.